Marianne was born in Budapest, is the mother of four children, including the famous comidian Adir Miller and grandmother of 11 grandchildren. She is married to Yoel Miller, a Holocaust survivor himself – one of the 100 children who survived the Theresienstadt camp. Marianne Miller shines charisma and has a magnetizing personality.She is also the mother of Adir Miller, “a title”, which she is most proud of. In a fascinating and most emotional way, she tells about herself and her family, during the holocaust, in Budapest, Hungary. 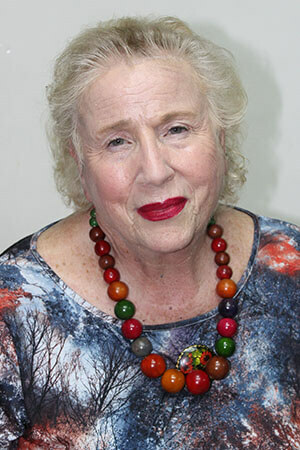 She has the most amazing story, how her mother saved her life in the holocaust, and how her father survived the hunger–camp, ” Bergen – Belson”, because he had been a sport – champion. She describes, with how much love Adir took care of his beloved grandmother, when she was on her dying bed. Her last words were: “Adir, you are my answer to Hitler!” In her deeply touching story, Marianne Miller also tells about her cousin, Gabor Erdos, who was shot into the Danube river, by the Hungarian Nazis, at the age of thirteen. Gabor left behind the most beautiful poems, translated into Hebrew by doctor Danny Neumann.Marianne “hypnotizes” her audience, by the way, she tells her stories. Marianne Miller’s anecdotes fill the hearts with a rich range of emotions, and leave tears in the eyes, and a smile in the hearts. People feel that something has happened to them, after listening to her stories.